Termites are very destructive creatures. They cause billions of dollars of damage every year in the United States. They are able to sustain themselves on the wood of our homes and landscaping in our Scottsdale yards due to the temperate climate. Termites live in colonies like ants and some bees and wasps. They divide the labor of caring for the young and protecting the colony among castes which is what helps determine the lifespan of each termite. 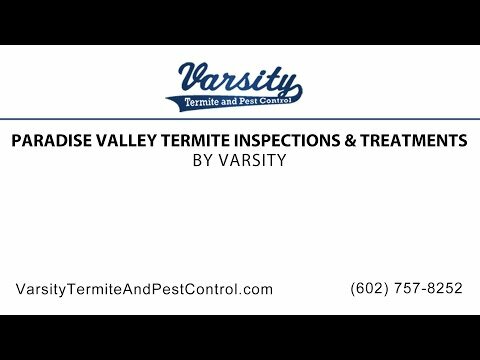 We here at Varsity Termite and Pest Control find this life-cycle very interesting and can do a termite control service in Scottsdale for you. How Does the Life of a Scottsdale Termite Begin? Termites hatch from eggs that are produced by the king and queen of the colony. Each termite egg can develop into any member of the termite caste system. This caste system usually includes worker, soldier, or reproductive termites. The king/queen can produce pheromones that control the development of immature termites. The production of these pheromones is how they keep the right balance of termites fulfilling each role in the colony. Each termite egg hatches into larvae and they then shed their exoskeletons (also called molting) to develop into workers, soldiers and reproductive termites. The molting of a termite begins when a soft exoskeleton develops under the hard exoskeleton. Once the termite reaches maturity the hard outer exoskeleton splits and falls away. The new exoskeleton then expands and hardens. This process can happen many times in a termite’s life cycle depending on the colony’s needs. As an example, a worker termite might molt into a soldier termite if the colony was in need of more soldier termites at that time. What Does Each Termite Do In A Typical Colony In Scottsdale? Baby Termites– These are the larvae or immatures. These little guys are nurtured by the worker termites until their caste is determined. They will become one of the other 3 castes upon maturity. Worker termites– This caste is usually the largest in the colony. Their role is to take care of the immatures, undertaking the labors of foraging, food storage , nest maintenance and some defense duties. They tend to be lighter in color and are soft bodied and typically have no eyes. Some colonies do not have a true worker caste, instead relying on nymphs to perform the same work without differentiating as a separate caste. The workers are generally responsible for the greatest damage that termites cause since they feed the entire colony. The average life span of a worker is one to two years. Reproductive termites – This is the winged caste (or alates). This caste is made up of a primary king and queen who have developed from alates from a primary colony. Their primary function is reproduction and colony formation. They have hardened, pigmented bodies and large compound eyes. They mate for life and if a king or queen die they are replaced by several supplementary reproductives that are slightly pigmented and either have short wing pads or none at all. This process insures the continuation of the colony. The primary king and queen can live for decades in ideal climate conditions. Soldier Termites– These termites defend the nest from potential danger, usually ants. Most Soldier termites are blind. The typical soldier termite has a large, dark, hard head and long powerful jaws that may contain teeth. Their bodies are often pale in color and their enlarged heads may be a wide variety of colors, from yellow to reddish-orange to black. Because of their enlarged heads the workers feed them. The colony’s survival depends on the soldiers to keep predators out. Soldiers typically have a life span of one to two years. Do All Termite Colonies Have the same Structure? Termite colonies range in size from 4,800 for Drywood termites to as many as 1 million for subterranean termites. This life-cycle and caste system is the one thing that all colonies have in common no matter what the climate. You will find that your Scottsdale termite colony is structured very much the same way. Termite Facts: Can they Bite Humans? Read the rest of Termite Facts: Can they Bite Humans?